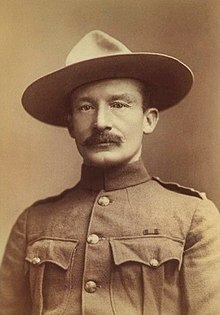 Robert Stephenson Smyth Baden-Powell, 1st Baron Baden-Powell of Gilwell (22 February 1857 – 8 January 1941) was a soldier, writer and founder of the world Scouting movement. He was the grandson of William Henry Smyth. ☉ — I have gone home. I went and saw a lot of them at their daily practice of fencing with bamboo sticks and practicing jiu-jitsu to make themselves strong and active and good-tempered. I say good-tempered because it is very much like boxing; you have to take a good many hard knocks and take them smiling. If a fellow lost his temper at it, everybody would laugh at him and think him a fool. In jiu-jitsu they learn how to exercise and how to develop their muscles, how to catch hold of an enemy in many different ways so as to overpower him, how to throw him and, what is very important, how to fall easily if they get thrown themselves. I expect the Scouts of Japan, if they visit England later on, will be able to show us a thing or two in this line. Happiness is not mere pleasure, not the outcome of wealth. It is the result of active work rather than passive enjoyment of pleasure. 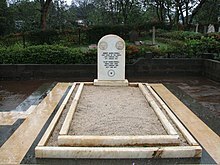 I have gone home (or "Going home") — the Boy Scout trail sign "☉" on his tombstone in a tiny cemetery of Nyeri, Kenya. B-P Quotes. Boy Scouts of America. Retrieved on 14 February 2019.
eTexts of Baden-Powell's works, at Project Gutenberg. This page was last edited on 14 February 2019, at 22:40.